We may have to get used to seeing Chinese brands such as BYD Auto, Great Wall, and Geely on American roads. Automakers from around the world are gathering in Beijing this week for China’s biggest annual auto show where as many as 100 new models will be revealed. Many of the brand names are familiar: General Motors, Volkswagen, Ford, Toyota, BMW, and Nissan among them. But domestic Chinese manufacturers, such as BYD Auto, Great Wall, and Geely, have a stronger presence than ever as they drive out of the shadows aiming to become significant brands in their own right. No longer content with growing their business in the world’s largest automotive market, these domestic brands will be previewing products that could soon be bound for the U.S., Europe, and other major markets. As is often the case in China, politics will hang like a cloud. This year's auto show has a heavy emphasis on electrified vehicles, for one thing, reflecting the Chinese government’s newfound focus on dealing with the country’s endemic smog problems. But the show will also play out on a global stage, as the auto industry becomes a pawn in the increasingly hostile trade debate between Beijing and Washington. Over the last two decades, the Chinese automotive market has grown from an insignificant backwater to the world’s largest. Last year, the country’s motorists purchased 24.7 million cars, light trucks, and crossovers, compared to just 17.2 million in the U.S. And, by some forecasts, that could grow to as much as 50 million as more of the country’s western regions catch up with the economic growth along the Pacific coast. As a result, even foreign manufacturers are shifting product development resources. That includes a production version of the Q Inspiration concept that Infiniti will unveil in Beijing. “It is going to cater specifically to the needs of the Chinese market,” according to Roland Krueger, the CEO of Nissan’s luxury brand. Over the last two decades, the Chinese automotive market has grown from an insignificant backwater to the world’s largest. A wide range of other foreign brands also are planning to reveal products specifically developed for China at this year’s Beijing show. 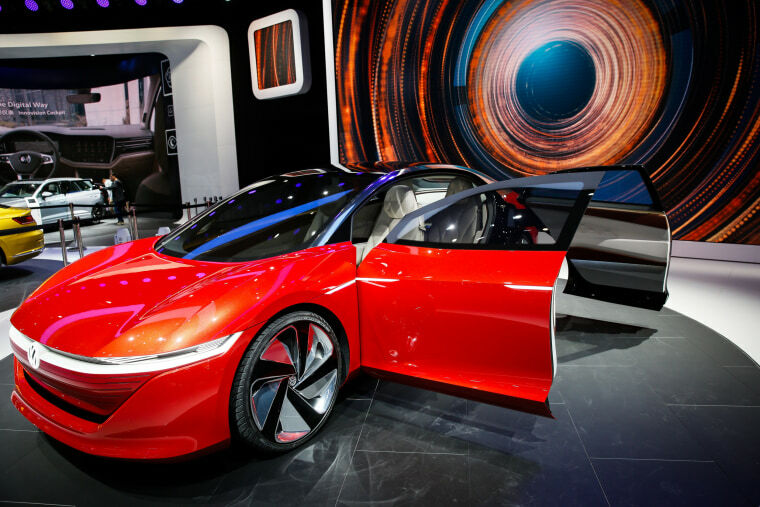 That includes Volkswagen, which plans to launch 15 electrified models by 2021. General Motors will also show a variety of local models through its various brands. And even its global products will show the influence of the Chinese market. “China has contributed very positively,” said Johan de Nysschen, who served as president of the Cadillac brand until being ousted last week. Chinese luxury buyers are even more picky than Americans, he explained, pointing out that such things as backseat climate and infotainment controls were introduced first for luxury customers who, in China, tend to prefer sitting in the back while letting a chauffeur do the driving. China has some of the most protectionist auto trade practices of any major market in the world. It levies a 25 percent tariff on foreign-made vehicles — 10 times what the U.S. demands — which has severely limited imports. Last year, American factories shipped barely 300,000 vehicles to China, or about 1 percent of the market. That has forced foreign manufacturers to invest tens of billions of dollars in Chinese factories. But even there they face a catch: a requirement that they partner with local brands, such as Shanghai-based SAIC, which operates joint ventures with GM, VW, and others. “It’s like competing in an Olympic race wearing lead shoes,” Tesla CEO Elon Musk, recently said. The California carmaker has struggled to meet its Chinese sales targets because of the tariffs and its efforts to find a suitable production partner have yet to pay off. Chinese President Xi Jinping this month suggested China will begin the reduce its auto import tariffs, and regulators now say they will also phase out the joint venture requirement — though Xi and others have warned they could actually toughen restrictions if U.S. President Donald Trump doesn’t back down on his trade threats. After a decade of false starts, Chinese automakers finally appear ready to start shipping their products to the U.S., Europe, and other foreign markets — and don’t want to see those doors close. Guangzhou-based GAC — the joint venture partner of Fiat Chrysler — is currently negotiating with potential U.S. dealers, and hopes to have a distribution network up and running in 2019. BYD, Great Wall, and Geely hope to follow. Geely actually does ship a small number of Chinese-made vehicles to the U.S. through its Volvo brand. GM imports the Chinese-made Envision SUV. And Ford will soon start importing the Focus, the next-generation model that debuted at this week's auto show. Many of the Chinese models debuting this week will be electrified which they believe will allow them to challenge traditionally dominant foreign automakers like VW and GM. And as the U.S. and other markets adopt increasingly stringent emissions and mileage rules, domestics like BYD — which will unveil two hybrids and an all-electric concept — are betting they will be positioned to become serious global competitors.